Photographer Mari Mäntynen recently put together the photo reportage of 3 ecological fashion brands in which she also cracked their workshops doors. The following will push the Heli MG Eco Faux Furs door wide open. My home workshop is based in Sipoo, in the rural capital area of Finland. The space, at the same time calming and inspiring like home studios are, is equipped with the modern machines, tools and fittings needed in the full creative process. Mainly I use it for turning the high-quality materials into the ready-to-tuft base items in the winter time evenings and weekends. Thanks to the traditional Rya sewing technique that is the last production stage and can be practised anywhere I don’t need to communicate “Out of office” to the people for the rest of the year when I’m constantly on-the-go between my farm and city lives. - I just bring my studio along. Meaning: I actively bring myself and my arts to people instead of them needing to make the effort and finding my workshop. - Don’t get me wrong, this is far from door-to-door vacuum cleaner sales or force feeding/spamming the strangers with my arts out there. Rather than those it’s effective guerilla marketing. While this way of working fits my comings and goings the most perfectly my choice is also strategic based on how the human brain works. For the fact something sticks to your mind the best when you’re looking for it the least. That’s usually somewhere other than the huge shopping centres, sale expos or other pricey events. Those are places one visits only when searching for a great deal. However, please note that the custom orders are strictly made in the professional workshop environment from start to the completion. And the practical things such as pre-order measurement taking, fittings etc. are done on my grounds - or the client’s - on appointment. In any other matter either it’s seeing my work in person or talking through the materials please drop me a line and let’s pick a place with a lovely cup of coffee and easy access for all. When you see me around either tufting or walking on the street wearing my art don’t hesitate to grab my sleeve - like so many lovely people already do! - I always have time for a chat! At the time Mari took the 2 photos above I was having my lunch break on a loading lift at the loading bay of a busy retail area near the Helsinki airport, enjoying the first warm spring breeze and a brief creative moment. When on the road I take my time and have as many stops as I need to proceed safely. On those breaks the coffee and sandwich go down first and then, while awaiting the caffeine to kick in I work on a couple of tuft rows. Preferably it happens out at the well maintained picnic areas. In the bad weather the car - and the coffeeshop - do fine. The ongoing project pictured above is the reconstruction of an old coat of which colour & pattern design I personally find slightly unfinished. The coat’s lines are also a bit old-fashioned. 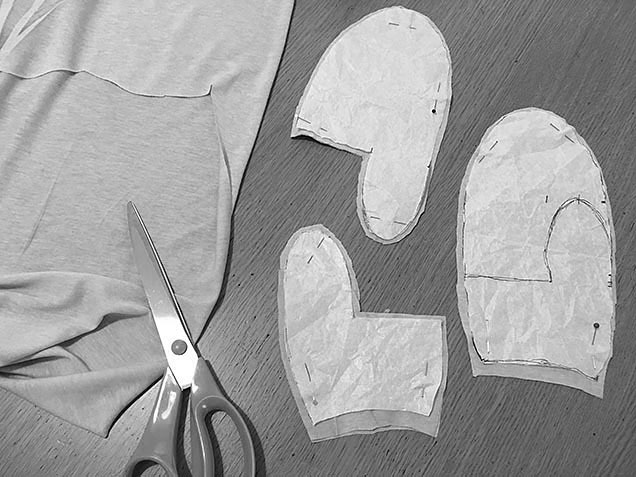 But nothing to worry; the handy tufting technique makes the base garment alterations - even the complete tuft pattern design changes - actually quite easy to do. So the amount of work already put in the piece years back won’t go to waste. The Eco Faux Furs pieces can be further developed time after time. My favourite place to start a work day at is my farmhouse’s sunny doorstep where the sounds and smells of the countryside summer surround me, only distraction being the gorgeous butterflies landing on my toes. One can only take a certain amount of alone-time at one go though and the day usually continues at the busy piers of the nearby waters. On the overcast day my studio lands in my late Granny’s sewing room in the attic. Among the great sewing memories it’s home for the Singer pedal sewing machine she taught me to sew with when I was at the primary school age. I serviced it last summer and it works like new - see it in the video below. It’s handy to have it working for the possible shape altering emergencies, among others. Depending on the duration of my trips my mobile studio fits in a small tote bag or one XL-size suitcase. At the least my tool box contains an element of ready-to-tuft Eco Faux Furs base item plus the relevant materials and hand-tools - never forgetting a couple of items ready-to-sell! Whatever the trip I plan the contents of my kit carefully upfront. That helps me stick to the deadline and other targets I’ve set for my project. Since I swopped my walk-in-workshop to the mobile studio some six years ago my productivity and the brand awareness have increased remarkably. Earlier I used to spend lots of time stressing about how to find and throw large enough number of people in. Now, instead, I can comfortably focus my energy on my creativity - in all terms. - Colleagues, what do you think of mobile working? The comments are on, feel free to leave yours below. Loads of congrats to the Finnish kodinkuvalehti.fi blogger Niina Tapojärvi i.e. Nelliina who is the new owner of the 6-year-project purse! 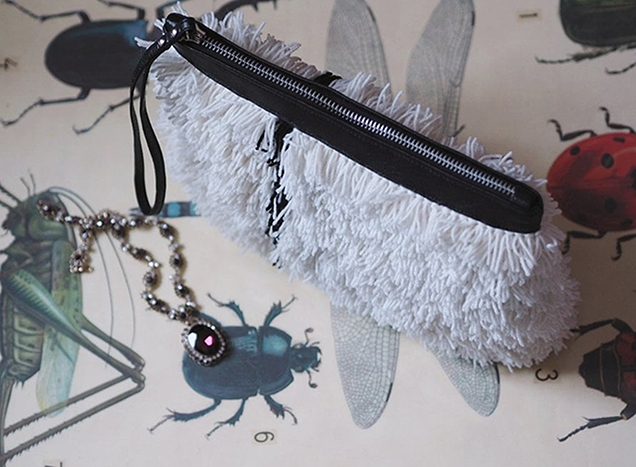 Linked below are 2 of Niina's recent posts featuring the purse. She’s telling in the posts that she already tested the hand-warmer feature of the purse last Friday and it did the job well. I’m delighted to hear that and thanking Niina for both lovely stories. I’m also sending a big thank you to all participants for your great work. It’s been a great pleasure guiding you to the world of Scandinavian rya rug sewing! The party season has kicked in and the few weekends before Christmas are all merry and bright. Which means accidents - such as make-up or self-tan lotion on the neckline of a garment or an accessory piece. But that’s just a sign of a jolly good time and there’s no reason for hesitation when picking out your outfit, for example one of the Eco Faux Furs pieces, for the festive season events. The Eco Faux Furs are very much wearable art and can be cleaned. Pictured is the much loved Swan neckpiece stained with concealer/ self-tan lotion after a few fab nights out. The accessory piece being crafted from wool and silk it is ‘dry-clean only’, however there’s no need for a visit to the dry-cleaners in this case. The first step is to grab a special silk & wool dry-cleaning wipe and carefully try removing the stains with it. I warmly recommend the Swedish Silk & Clean International AB ‘s alcohol containing wipes that don’t leave ring marks on silk and other delicate natural fibres like the water and oil based cleaning wipes do. - So don’t use the regular baby wipes or make-up removal wipes for cleaning your Eco Faux Furs linings unless it in very rare occasions is made from polyester satin! After the stain removal, to remove unwanted odours such as cigarette smoke remains or food smells air the garment outside in dry breeze. Avoid spraying perfumes, deodorants and haircare products on wool and silk, do add them before you get dressed. 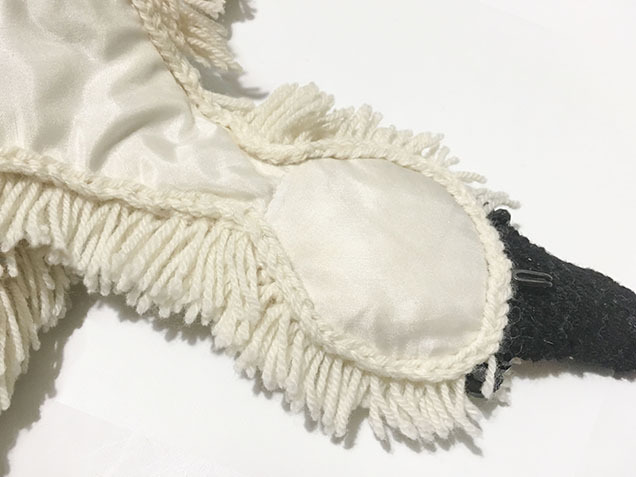 If the piece is stained on the tuft side for example with food, wine, oil,… the soonest, bring it to the special dry-cleaners who are proven professionals in cleaning the woollen textiles. If you’re unsure where to go looking for one, please drop me a line and I’ll find one for you. 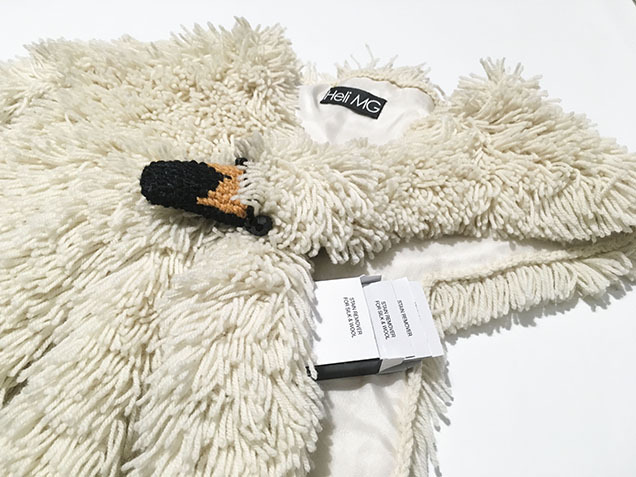 Please note: if you borrow Heli MG Eco Faux Furs from a fashion library what ever the case return the garment immediately to your local branch and let the authorised personnel deal with the cleaning, don’t try and do it yourself. There’s no need for worrying your heart out either as said before the Eco Faux Furs can be cleaned to look like brand new again and again!